Due to my health problem, I sold this bike to a cyclist from Louisiana in July, 2007. I've been selling the Rohloff 14 speed hubs for a while, but only recently got one for myself. The bike it's on is a Thorn Raven frame, specifically designed for that application. The Raven is intended as a frame for serious touring, very solid, based around 559 mm (26 inch MTB size) wheels. The Raven is actually designed for the U.K. market, and that's a good thing for me, because it means the cable runs are optimized for right front/left rear brake setup, which is my preferred arrangement. One of the strangest aspects of this is that the cantilever studs are mounted on the back of the front fork! This would cause problems if I ran my front brake from the left lever, as is usual in the U.S. but it works fine with the cable coming from the right. The most obvious weirdness of the bike, as I've set it up, is the double handlebars. This is my second experiment with double bars. I did a demo bike for the shop this way and the setup seemed to me to have real potential. I did a variant on this for the Thorn. The Thorn has a Reynolds 531 steel fork, 1 1/8" threadless. I installed a conventional threadless stem for the drop bars, but I omitted the usual "star fangled nut" in the steerer and the cap that usually goes on top of the stem. 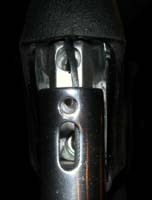 Instead, I installed a wedge-type quill stem into the hollow steerer. This is a stem with a 1 inch outside diameter, intended for use with a 1 1/8" threadless setup, but it was a good fit. I cut down a pair of aluminum MTB handlebars for the upper position. The Rohloff shifter doesn't fit drop bars, so it's up top. This looks strange, but it turns out to be extremely pleasant to ride. It's like two totally different bikes when you switch between lower and upper bars. The drop bars are set a bit lower than I would normally mount drops, giving me a somewhat more agressive riding position on them. The high bars provide a semi "sit-up-and-beg" position, though a bit farther forward than a typical cruiser. I even find the upper bars a convenient place to lean my forearms in a quasi aero position. 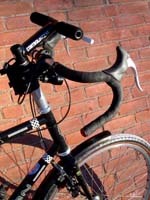 The levers on the drop bars are Dia Compe 287Vs. I've previously been somewhat less than thrilled with these levers, due to cable friction issues. For this installation, I left the cables outside of the handlebar tape. This avoids the somewhat nasty bend the housings normally get where they exit the brake levers, and I'm quite satisfied with the performance of this setup. The end of the front brake cable is secured to the 287V lever in a somewhat mickey-mouse manner that I would be reluctant to do on a customer's bike. I bent the end of the cable down over the internal block in the lever, then clamped it with the small screw on the front of the lever. I did a bit of filing on the block to make room, and to reduce the sharpness of the cable bend, but even so I'll be checking the cable for fraying on a regular basis. The actual brakes are Shimano LX "V Brakes" with Kool Stop MTB pads. I never need more than two fingers to stop as fast as I need. Seatpost is a Titec Hell Bent for more setback to the Brooks Conquest saddle. Tires are Continental Avenue 26 x 1.75 slicks. 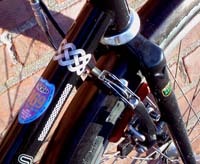 The rims are Mavic X517s, front hub is a Van Dessell, laced in a whimsical "4-leading/4-trailing" pattern. 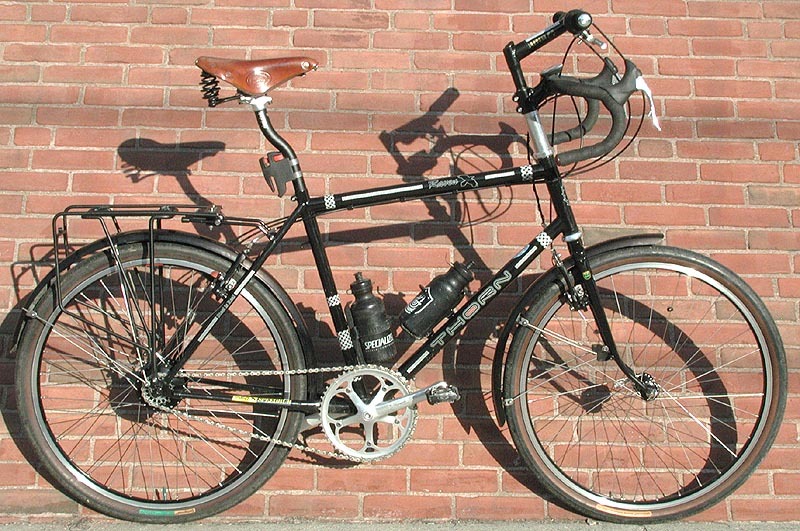 I think this is pretty good gearing for touring, but I have only been taking local rides on it so far, though mostly carrying a moderate amount of weight in my Carradice Nelson Longflap, including my Powerbook. I am not convinced I made quite the right gear choice, as I use the top gear a good deal, but almost never use the bottom gear. I may try swapping out for a 16 tooth. I find the current top gear spins out for me at about 33-34 mph, and I really enjoy going as fast as possible down the hills. At present (May 2004) I've got something over 300 miles on this bike, and I'm just delighted with it. It is comfortable and stable. Indeed, I've gotten it up over 40 miles per hour a couple of times on descents, and even at such high speeds it feels solid and secure. The photos below are from an earlier incarnation, when I had first put the bike together as a fixed-gear, while waiting for the Rohloff hub.